SMDM has been my professional home for about 20 years now. 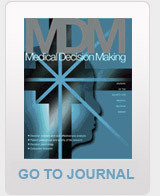 In the beginning it put me on the track of my PhD thesis, and research and support of SMDM members helped me shape it. The interaction with long time members caused the shift in my research from utility assessment to shared decision making. I can say that their research has been the engine driving the current developments in shared decision making in the Netherlands! And I love the atmosphere in the Society, which combines enthusiasm for high quality research with a drive to improve health care and lots of amicability and fun!